Jacqueline Starting and her husband Jesse welcomed Baby Olivia on June 4. Her mother brought her Governor General’s award to the hospital for her. UFV helped Jacqueline Strating of Abbotsford discover and develop her passion for helping others. And now her education is helping her make a difference in the lives of marginalized women and their families on two continents. 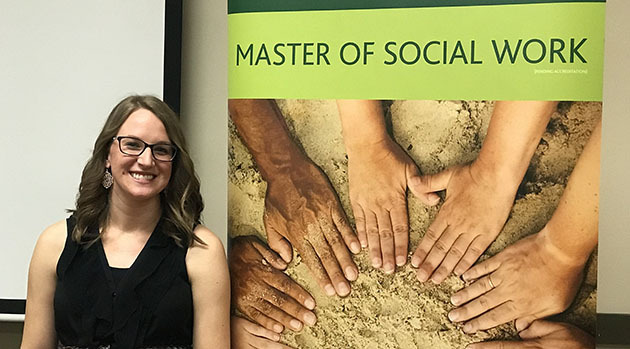 Jacqueline, who recently completed her Master of Social Work at UFV, is the 2018 winner of the Governor General’s Gold Medal, awarded to the student graduating from a master’s degree program with the highest GPA. Her Bachelor of Social Work studies expanded that interest into women’s health and mental health fields. Jacqueline completed her bachelor’s degree in 2014 and began working part time as a youth and family counsellor at Alouette Addictions Services in Maple Ridge. She also started to work part time as sponsorship and programs manager for Hope for Korah, an Abbotsford-based non-profit agency dedicated to helping families in Korah, Ethiopia, an urban slum with an estimated 130 000 people situated near the city garbage dump.Hope for Korah runs family empowerment programs funded by North American sponsors, aimed at lifting families out of extreme poverty through helping its clients, mainly women and families, with job skills and literacy training. They use a holistic approach that addresses families’ economic, social, physical, spiritual, and psychological needs. “Many of our participants start our programs completely illiterate. We set them up with the skills they need to get a job or start their own small business.”She has visited the Hope for Korah location in Ethiopia several times and formed close ties with the client families and the Ethiopian employees, including social workers. Working for Hope for Korah inspired Jacqueline to enroll in UFVs Master of Social Work program because she saw a need for research that evaluates the work the organization is doing, measures results, and makes recommendations for the future.Her research study focused on culturally relevant strategies and resources to promote physical and mental health for women in poverty in Korah. Her recommendations included recognizing the fundamental importance of spirituality in the Ethiopian approach to mental health, and the importance of honouring that approach when designing programs. 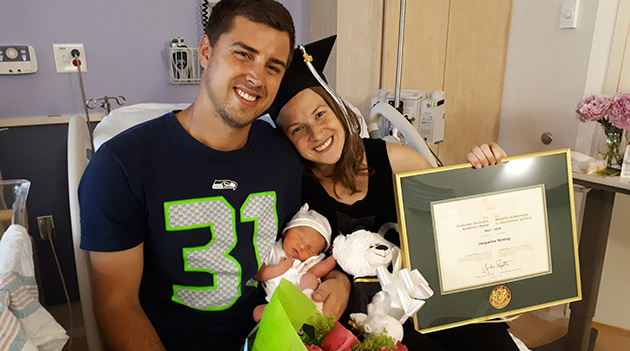 While her major research project for her master’s degree focused on Hope for Korah, she also completed a practicum at Abbotsford Community Services as part of her program, working with young parents and other community members through providing one-to-one counselling. She plans to become a registered clinical counsellor, and was grateful for the opportunity to gain needed clinical hours through her master’s studies. It’s been a busy few months for Jacqueline. She finished up her master’s degree in April, presenting her project at a special research sharing event. She attended her brother-in-law’s wedding on June 1, and was scheduled to be induced into labour for her first child two days later on June 3. Understandably, she was not planning to attend her Convocation ceremony on June 6. Her future plans include counselling women who have experience trauma locally, and continuing to work for Hope for Korah, and helping to implement some of her research findings into the organizations plans and approach to partnerships in Ethiopia. “I’m very grateful to my husband and family and friends for all their emotional support over the course of this program,” she notes.